People enjoying the weather in Mérida’s Plaza Grande. Following a lifelong dream to live in Mexico’s Yucatán Peninsula, Linda left her home in Oregon and moved in 2012. “As a student back in 1968, I attended a six-week study session at the University of the Americas in Mexico City. I then began exploring other parts of Mexico and fell in love with its history and cultures,” says Linda. “I returned to school after my trip and changed my major to Anthropology/ Archaeology.” She stuck with it, too, completing both an undergraduate and a master’s degree. “I often visit the Mérida English Library to do my research, and participate in their various community programs with speakers, house and garden tours, concerts, potlucks, artist groups, and the like. Few expats stand on formality, so it is acceptable to invite or be invited to impromptu outings, movie nights, or exploration trips with others. There are free concerts every night in one of the historic center parks. Life here is lived at a slower and more relaxed pace,” Linda says. For Linda, a relaxed pace seems well deserved. As a divorced mother of two, knowing that the income of an anthropologist/ archaeologist would not be enough for her needs, Linda started law school the week she turned 40. “I practiced law for over 20 years in Oregon before I could return to my true passion,” she says. And Mérida was the ideal place for Linda to re-engage. High-speed internet is readily available throughout most of the city and is offered by several providers. 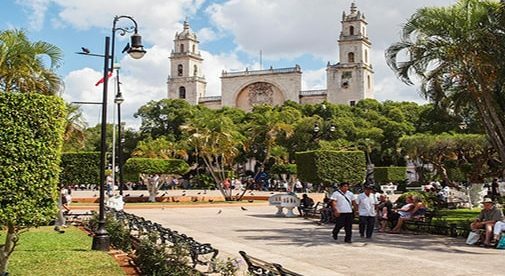 Coming and going from Mérida is a snap, with freeways and highways connecting it to the Riviera Maya, on the Caribbean coast, as well as to the highway system throughout Mexico. And Mérida has its own international airport, which makes airline travel readily accessible. Medical care is some of the best in the world, with many doctors speaking English, and modern hospitals to provide for any surgery needs. And good medical care is affordable, generally about one-half or less of costs north of the border. Participation in one of the two national healthcare plans can reduce your annual bill to less than $500 a year, depending on which plan you qualify for. Costs as low as these allow Linda to indulge in a few luxuries. “Housekeepers charge around $20 for a full day of deep cleaning; today’s breakfast, including fresh-squeezed orange juice, was only $2.50. Additionally, I have an INAPAM (senior citizen) card that allows me free entry to museums, archaeological ruins, discounts on bus fares, department stores, and cultural events.” Given her interests, that’s probably Linda’s most valuable benefit of all.